We live on a planet which has limited resources, and its state of health, which after all is also ours, depends on our daily actions. 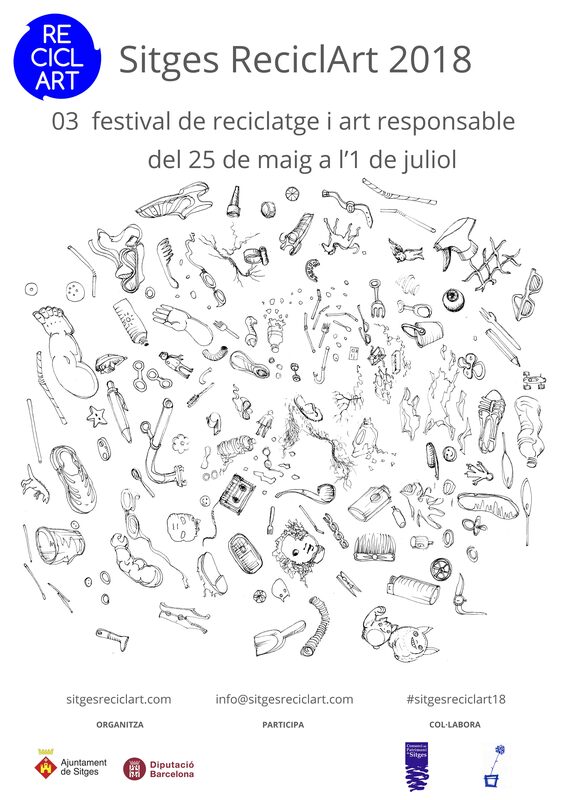 The Sitges Festival ReciclArt 2018 reaches its third edition with the same object: to make aware about the effect our habits have on the health of the environment by means of enjoyable activities which demonstrate the reality of what is happening in the ocean and its shores, so that we become conscious of the fact that the responsible use of plastics will result in less contamination. Every day we are more those who collect plastics on the beaches as a living example that in some way our activity has not been in vain. In addition, the mere fact that the recollection has transformed what until then had been rubbish into artistic works, that some of these works have provoked a smile in more than one of us; and by these works these residues have recovered their lost dignity after accidentally finishing their journey with no return on our shores, gives reason enough to continue in this way to obtain fruit from creativity – thanks to the above-mentioned, the residues that reach our shores in the future will no longer be the same nor will be regarded in the same way and this is what gives our work as a whole a meaning. Whoever you are, wherever you come from: welcome. Sitges ReciclArt is waiting for you. The programming of this edition is the continuity of the anterior and the result of the progressive changes realized over what has been achieved to improve in a concrete manner the first object. So what was our goal yesterday is where our next aim, which is the same as always: visualize marine contamination by plastics with creativity´s own language. With its headquarters in the Centro Cultural Miramar, this festival offers a varied programme of activities for all publics. The Sitges ReciclArt Exposition which presents a selection of works of responsible art creators, the creation of an Installation of Collective Art on the occasion of the World Oceans Day and the local fiesta of Sitges, Corpus 18, reusing plastics that the sea sends back to the beaches, and new meetings open to the participation of creators, entities and public in general. No action is more important than another, but many small actions create a larger action that favors everyone. No matter how small a concrete action, the more significant it is than the most brilliant of an abstract action. It is the daily actions that create change and generate a new way of doing. The programme of Sitges ReciclArt includes an interesting series of activities for all publics. The collective recycling and responsible art exposition will take place in the Centro Cultural Miramar from 25 May to 1 July. Take a look to the list of participating artists (only Spanish and Catalan). The closing ceremony of the Sitges ReciclArt Festival 2018 took place on Sunday July 1 at 12:30 am at the Miramar Cultural Center. And if you leave us your contact information we will inform you by e-mail.